It is apple time in my neck of the woods. When fall comes around I really get the urge to start baking with apples. The smell of baking apples with sugar and cinnamon fills the house with the most amazing aroma, no matter if it is apples baking in pies, cakes, or whatever. A couple of days ago Mike mentioned that he was hungry for a coffee cake. Little did he know I was already looking for an apple coffee cake to bake over the weekend. I guess after 31 years of marriage we are being to think alike. I found a recipe at tastebook.com that had caramelized apples and toasted pecan in it, when I saw this recipe I knew that this was the one that I was going to make. Really, you can’t go wrong with caramelized apples and toasted pecan, now can you? The aroma of the apples and cinnamon filled the house; I couldn’t wait for the coffee cake to come out of the oven so that we could sample it. I baked the recipe for the time stated on the recipe, did the insert wood pick come out clean test, and still the coffee cake was a little under baked. So make sure when baking this coffee cake that even though the wood pick comes out clean that the center of the coffee cake is fully set. I was a little disappointed when cutting into this and finding the center not quite done. I was contemplating on baking it a little longer, but everyone was cutting the coffee cake and taking pieces to eat, so that ended that. With that said even with it being a little under baked the coffee cake was amazing. 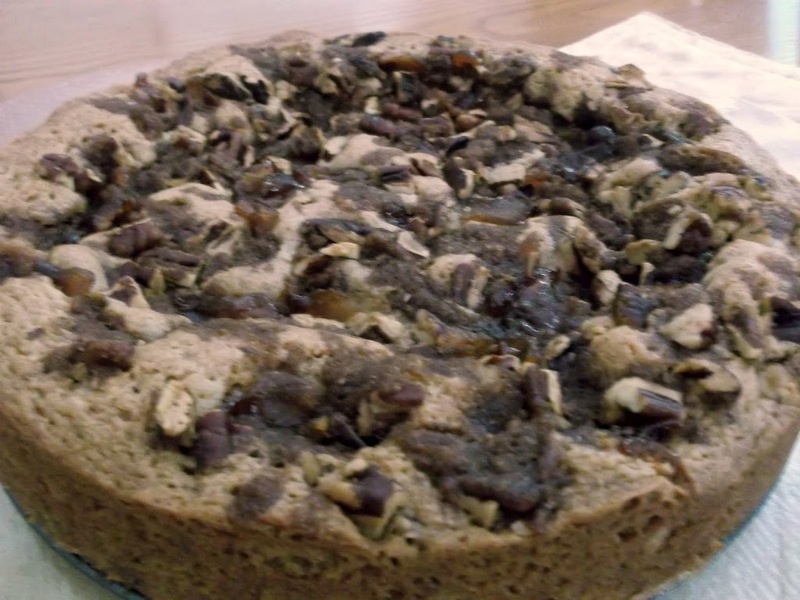 The flavors of the caramelized apples and toasted pecans really put this coffee cake over the top. 1. Preheat the oven to 350 degrees F. Grease an 8 inch round spring form pan or baking pan and set aside. 3. Making the streusel topping: In a medium bowl, combine the brown sugar and cinnamon. Stir in the butter until well combined and mix in half the pecans. Set aside. 4. Make the apple filling and topping: In a small heavy-bottomed saucepan, cook sugar over moderately low heat. Without stirring, shake the pan to melt sugar evenly until melted and dark golden. Remove saucepan from heat and carefully add apples and vanilla (mixture will vigorously steam and caramel will harden). Cook mixture over moderate heat, shaking pan and stirring occasionally until caramel is dissolved, liquid has evaporated, and apples are tender but still hold their shape, about 10 to 15 minutes. Spread the apples on a sheet pan to cool. 5. 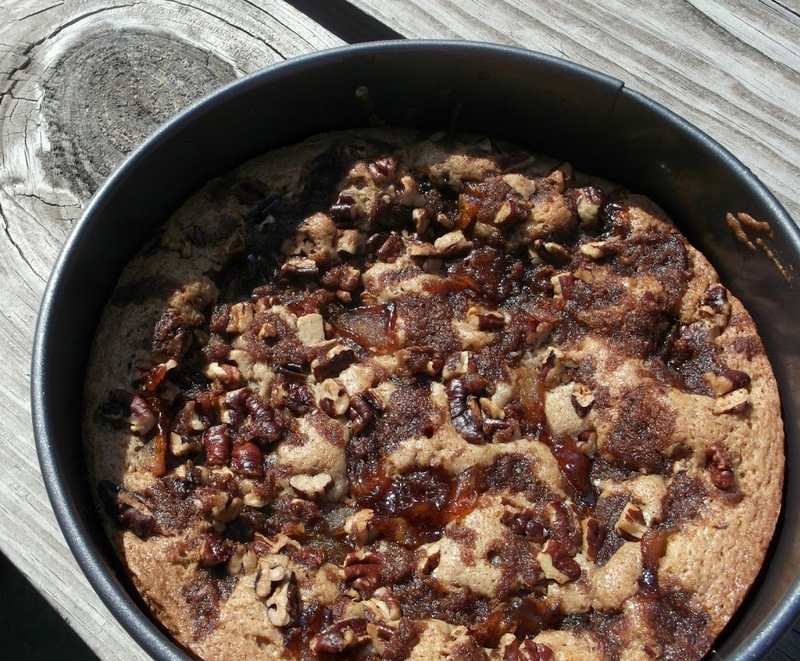 Make the coffee cake batter: In a large bowl, whisk together the flour, baking powder, baking soda, cinnamon, and salt. In another bowl, whisk together the yogurt, oil, brown sugar, granulated sugar, egg, and butter until smooth. Pour the wet ingredients into the dry mixture and with a large spatula, mix until well combined. Fold in half the cooled apple filling and the remaining pecans and pour into the prepared pan. Sprinkle with the half the streusel and top with the remaining apple filling. Sprinkle with the remaining streusel. Bake until a toothpick inserted in the center comes out clean; about 30 to 35 minutes (make sure that the center of the coffee cake is set as well). Let cool 20 minutes and cut into wedges. Serve warm or at room temperature. I can tell you for a fact that wouldn’t last 2 minutes in my house. Everyone would take a chunk the minute I took it out of the oven. Oh, well, guess I’ll have to put my hypothesis to the test. 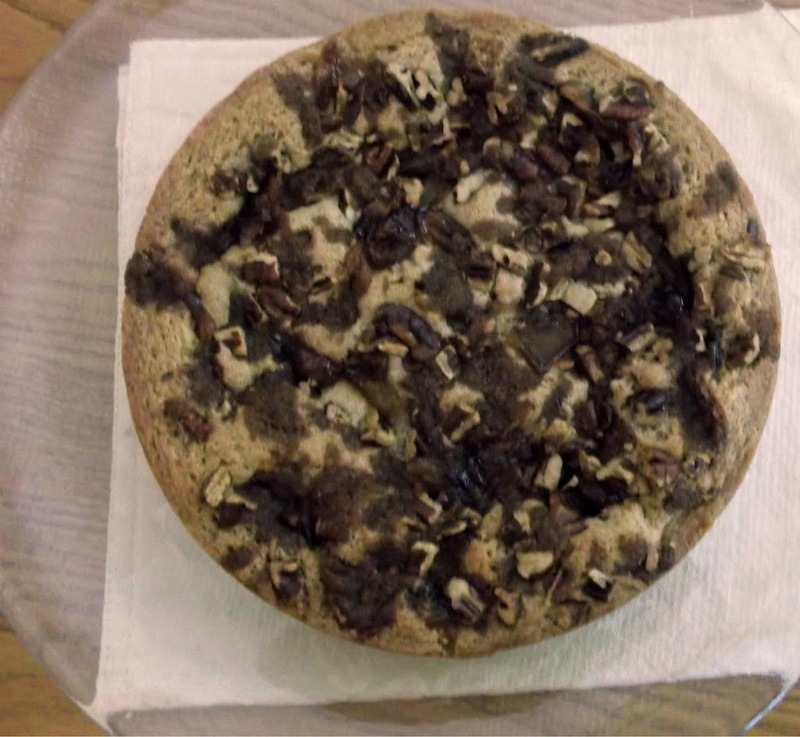 What a lovely coffee cake… and I love that it was still tasty even when a little under baked. It looks delicious. it’s perfect! and looks great. I’ll make it for a breakfast! This looks terrific! I just had a very late lunch, and thought I was full – but now I’m hungry again! Really nice. I’ll eat anything with pecans. Thanks. I am ready to do some apple baking too! You make this sound so enticing! It looks absolutely delicious.